Jaundice is a yellow discoloration of the skin, mucous membranes, and the whites of the eyes caused by increased amounts of bilirubin in the blood. Jaundice is a sign of an underlying disease process. Bilirubin is a by-product of the daily natural breakdown and destruction of red blood cells in the body. The hemoglobin molecule that is released into the blood by this process is split, with the heme portion undergoing a chemical conversion to bilirubin. Normally, the liver metabolizes and excretes the bilirubin in the form of bile. However, if there is a disruption in this normal metabolism and/or production of bilirubin, jaundice may result. 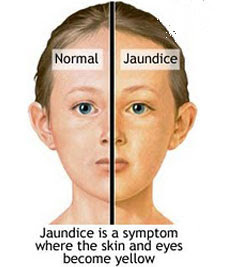 Homeopathy treatment helps for Jaundice. And helps to prevent further recurrence also.